Membership is available for those descendants who can document that their ancestors fought or aided in the American Revolution. 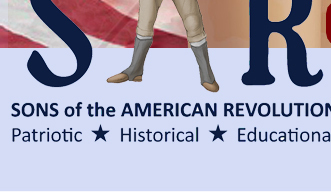 If you are interested in your genealogy, and can meet the criteria of the SAR, take the time to be rewarded by joining the Sons of the American Revolution. Who can Join The SAR? The SAR is a "lineage" society. This means that each member has traced their family tree back to a point of having an ancestor who supported the cause of American Independence during the years 1774-1783. Qualifying ancestors for SAR membership are men or women who rendered military or civilian service to the Revolutionary Cause between the Battles of Lexington & Concord (April 19, 1775) and the signing of the Treaty of Paris formally ending the War (September 3, 1783). You must be a bloodline descendant from the Patriot Ancestor. "Collateral descendants" (descendants of siblings of the Patriot) or descendants by adoption are not eligible for membership. Full membership is open to males who can document their lineal descent from a Patriot Ancestor. Any male shall be eligible to membership in this Chapter who is a citizen of good repute in the community, is the lineal descendant of an ancestor who was at all times unfailing in loyalty to, and rendered active service in the cause of American Independence, either as an officer, soldier, seaman, marine, militiamen, or minuteman, in the Armed Forces of the Continental Congress, or any one of several Colonies or States; or as a signer of the Declaration of Independence or as a member of a Committee of Safety or Correspondence; or as a member of any Continental Provincials or Colonial Congress of Legislature; or as a recognized patriot who performed actual service by overt acts of resistance to the authority of Great Britain; provided, however, that no person who has advocated, or is now advocating the overthrow of the Government of the United States by use of force or violence shall be eligible for membership in the Chapter. Regular Army; Militia; Navy; Minuteman. Examples of patriotic civilian service include: providing supplies to troops; giving or lending money for military needs; clergy preaching against Great Britain; signing oaths of allegiance to the new country. Descent from the Patriot Ancestor may be through either the mother's or father's side of the family. Direct-line descent is not necessary: the line may zigzag through the various generations, where the surname changes. The goal is to document the linkage between each generation. Many men have more than one Revolutionary ancestor. Once you are a member, you are encouraged to submit "supplemental" applications for those additional ancestors: by doing so, you are potentially opening up membership to relatives of yours through that particular line. process. Here is the SAR Worksheet.docx that will get you started. How Much Goes Membership Cost? Dual membership = Only $25 - Your primary membership with another SAR Chapter covers State & National fees. These are typical cost. Piedmont Chapter New Member Application Fee = $90. or implied endorsementor recommendation by the Piedmont Chapter or the Sons of the American Revolution of any products or information so reflected.